While Dr. Jaclyn Jensen and the entire Renu Dental team strive to ensure patients feel comfortable and relaxed from the moment they arrive, we know that some patients need a little extra help feeling calm and comfortable when they visit the dentist. We often recommend nitrous oxide sedation for these patients. Nitrous oxide is a mild form of sedation that is inhaled through a nasal mask during procedures. 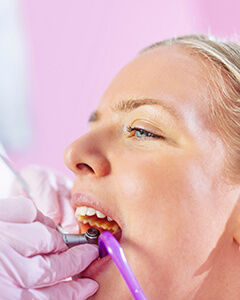 The patients’ vitals are closely monitored by the dentist throughout treatment and administration of the sedative which makes nitrous oxide an extremely safe dental sedation option. Dr. Jensen can easily adjust dosage for optimal comfort from start to finish. Best of all, the sedatives wear off as quickly as they take effect allowing patients to return to their regular routine right away. Contact us to find out more or schedule an appointment today.